In the northwestern corner of Yellowstone National Park, there is an ever-changing terrain made up of centuries of limestone and mineral formations. This almost alien landscape is known as Mammoth Hot Springs, a geo-thermal phenomenon that started possibly before the dawn of man, and continues today, building, sculpting and re-sculpting as it continually spills minerals onto the earth. These formations, called terraces, are perpetually evolving, slowly encroaching and reforming its surroundings, burying whatever previously existed...with the exception of a few trees, persistent against the constant unrest of evolution, even after their lives have ended. 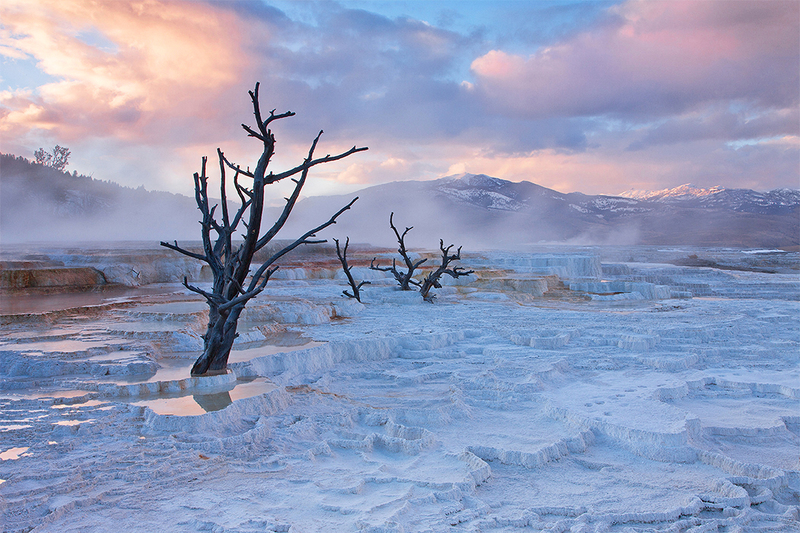 This photograph captures the unique light and atmosphere of an early spring sunset over the hot springs, which casts an unearthly glow over the scene, as if showing it frozen in time, forgotten by time.